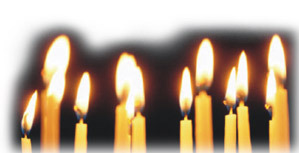 Bereaved Parents of the USA, Tampa Bay Chapter, will hold its annual Candlelight Remembrance Ceremony at 7 PM. on Sunday December 11, 2016. This day is also the Children's Worldwide Candle Lighting event (created and shared by TCF) where candles will be lit around the world in memory of all children that have died in every time zone starting at 7:00 PM. Please join us in this beautiful tribute to our children. Any bereaved parent or family member and friends are invited to participate. For those of you who are newly bereaved, we encourage you to attend. This service can make handling the holiday season a little easier. Auditorium at St. Joseph’s Hospital in Tampa. RECEPTION - We will have a reception following the ceremony, and we invite you to bring if possible, your child's favorite food (i.e. vegetables, chips, snacks, sandwiches, etc.) to share with others. We normally have an abundance of desserts. PICTURE PRESENTATION - A Special Slide Picture Presentation of our beautiful Children! If you are planning to attend our Candle Light Ceremony, mail a picture of your child, and include their full name as you want it displayed on the slide presentation and also the birth and death dates, to: Lori Scragg, 1105 Fredrick Lane, Brandon, FL 33511. NOTE: Due to time restraints, only pictures of children whose parents are attending the Ceremony will be shown. Thank you for your understanding. Picture should be of your deceased child only. If your child's picture was included in previous year's candle lights, any of the National Gathering closing ceremonies, or Chapter Newsletters and you want to use the same photo, just let Debbie Nemitz know that. Pictures mailed in will be returned to you at the Candle Light Service - please pick them up at the registration desk. You can scan the picture yourself and email to debbie.bpnews@gmail.com, but please be sure it is at least 600 dpi.. If you have any questions, please call Debbie Nemitz at 813-501-9567. NO BOUTIQUE - There will be FUNDRAISING RAFFLE OF GIFT BASKETS. You can donate a basket in memory of your child/children or you can send a donation in with your registration and we will do one for you in memory of your child/children. Please call Lori Scragg at 813-361-2946 if you have questions. * If you have votives from previous years that you would like to donate, please get in touch with us so that we can plan accordingly. You may call either Lori at 813-361-2946 or Debbie at 813-501-9567. Thank you! See you December 10, 2017 at 7:00 p.m.!